This chicken strips recipe cooks the meat crispy on the outside but keeps it juicy on the inside with no deep frying required. Wash and cut the chicken into strips and coat them well in the seasoned flour. In a non stick frying pan, over medium high heat, melt the butter and add oil. Wait till the pan is hot before adding the meat. You’ll know if it’s hot enough if it sizzles when you sprinkle it with a few drops of water. Now add the chicken strips and sear meat on both sides quickly till brown. This helps them lock in their natural juices while making a crispy texture on the outside. Once the meat is seared add a splash of water. Cover the pan while still on medium heat and cook about 4 minutes, then turn over and cook another 4 minutes or until chicken is thoroughly cooked. Always make sure there is just enough moisture in pan so that the chicken doesn’t burn. At anytime you can always add a little splash of water if you have to. Once cooked, remove lid, there should be no more liquid in the frying pan. Crisp the chicken pieces further if desired. To complete the meal serve with vegetable sticks or their favorite side of something healthy such as corn or oven baked zucchini sticks. Add a side of plum sauce for dipping fun. Seasoned flour is an excellent ingredient for making meat taste delicious without actually having to deep fry it. There are many types of seasoned flour you can get at your local supermarket or you can create your own with regular flour just by adding some spices to it. Try adding a little salt, pepper, paprika and garlic powder to one cup of flour. Taste the flour and add more spices till you get the flavor you want. Most kids love this meal even the ones that are very hard to please. But these little strips are so tasty you might have to stop yourself from eating most of them before dishing them out. 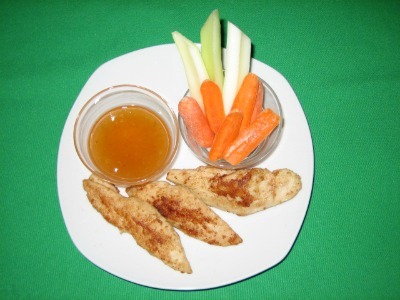 This is a great meal you can enjoy with the kids.